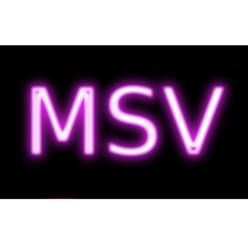 Mass Site Visitor (MSV) is designed to generate large amounts of traffic to websites of your choice through the list of proxies in a multi-threaded way. 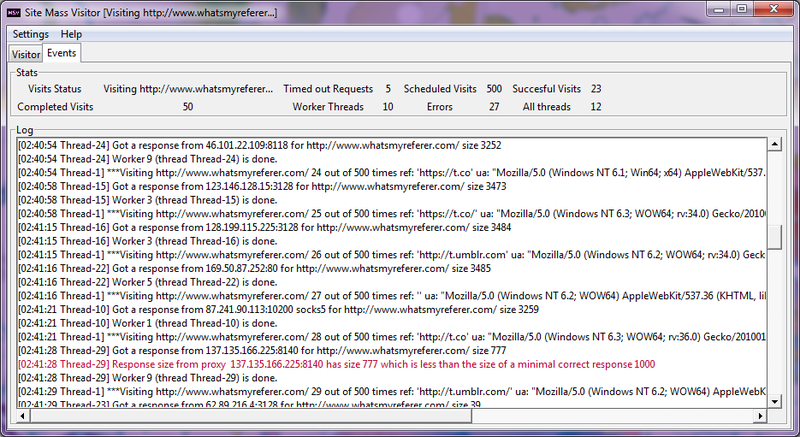 You can set referrers and user agents, which along with proxies will be randomly selected to create a browser session. Referrers, user agents and proxies should be stored in a text-file and can be appended to an already loaded list in the program by pressing the 'Load the list' button. Remember to add the word socks5 after the ip of a public socks4/5 proxy, separated by a whitespace. Results for this browser session you can select to save as an image snapshot for every visit (to see how web-site is seen from different IPs), with a customized behavior of the browser while it's on page, you can set the program to click some links too (check out Settings - Options). There is an ability to filter out non-responsive proxies from the ones that work, and save them to file (Settings - Export Healthy Proxies). If you don't have a proxy list of your own, and the one supplied with MSV isn't satisfactory (with time those proxies might cease to work), there is an ability to scrap public proxies from the web, Settings - Import Proxies from the web, if you are scraping proxies from the web, you don't have to worry about adding the proxy type for a socks proxy, program will save all the info in the right format. The log of events, that happened in a context of the program is available for the user to study. It will contain messages about the proxy scraping process, as well as the process of sending traffic through proxies to the target website. 2. Chromedriver (non-headless browser to influence video/audio view counts on web-sites that track the playback from visitors, and count anonymous, non-logged-in viewers). Pro-tip: don't use JS referrer spoofing with this feature, because media sharing sites don't care much about traffic sources, that would be only useful for influencing Google Analytics. 3. More proxy filters for scraper. 5. Private proxy support, consult the manual as to how setup you proxy list to supply authentication info for a private proxy provider. 6. Editable browser dimensions. Check the Options menu, use the format, as you'll see for the default resolutions, provided with the program. 7. Firefox geckodriver. For cases when Chrome is not enough. Nightly is a preferred version, because only it was working properly without crashes on different machines. 8. Experimental: Alexa toolbar/extension. Warning: works stably only with Firefox Nightly. 9. Multiple web-site destinations for a session. One web-site per line in a textifield - one of those will be randomly selected each time to visit. Don't forget to reduce thread count if you are using low-end machine. Having several dozens of threads running browser sessions that are being created/destroyed constantly, and are trying to load some web-page is a performance-heavy task.